A low-dimensional high-Q resonator has been proposed and its frequency-response characteristics have been investigated. The specified resonator features the frequency-response characteristics that are electrically tunable by using a semiconductor diode with variable capacitance. D. A. Usanov, S. S. Gorbatov, V. E. Orlov, and S. B. Venig, “Resonances in a half-infinite waveguide with iris related to excitation of higher modes,” Pisma v ZhTF 26, No. 18, 47 (2000). 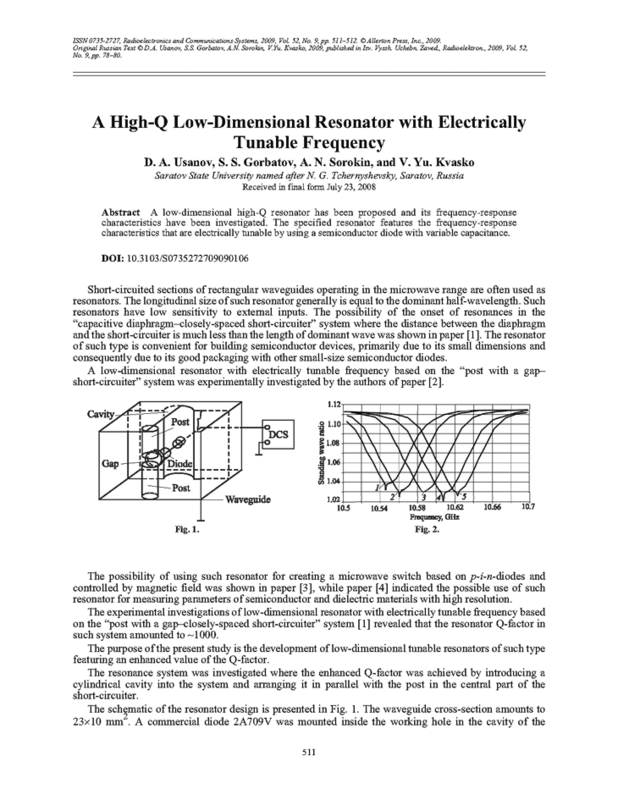 D. A. Usanov and S. S. Gorbatov, “Electrically controlled microwave resonator,” Pribory i Tekhnika Eksperimenta, No. 3, 100 (2006). D. A. Usanov and S. S. Gorbatov, “Magnetically controlled microwave switch built on p-i-n diodes,” Pribory i Tekhnika Eksperimenta, No. 1, 72 (2003). D. A. Usanov and S. S. Gorbatov, “Waveguide measuring resonator,” Izv. Vyssh. Uchebn. Zaved., Radioelektron. 45(9), 26 (2002); Radioelectron. Commun. Syst. 45(9), 18 (2002).